Ryan Sinclair (Tosin Cole) is on his YouTube channel, he usually talks about issues concerning himself, but he’s now here to talk about someone else. Ryan: “So today I want to talk about the greatest woman I ever met.” We switch to a picturesque hillside where 19 year-old Ryan is trying to learn to ride a bike with the help and loving encouragement of his grandmother Grace O’Brien (Sharon D. Clarke) and his step-grandfather Graham O’Brien (Bradley Walsh). Ryan is frustrated with his failure to learn, so he throws the bike off the cliff. Grace and Graham are on the train heading back home. Grace is affectionate towards Graham as a fellow passenger Karl (Jonny Dixon) looks on. Grace: “Can’t keep his hand off me.” Graham: “Behave yourself.” Grace: “Never.” Suddenly the train stops and the lights go off. Passengers are running off the train. Grace: “Graham, the doorknobs are locked, I can’t get them open.” A door bursts open and an energy charged ball of tentacles heads towards them. Grace calls Ryan. Before the creature can reach them, a woman comes crashing through the train roof. It is our beloved hero, the Doctor (Jodie Whittaker). Though dazed from the fall, she immediately slows down the ball of tentacles. Grace asks about her entrance. The Doctor: “Oh yeah a long story, I’ll tell you about it later. Doors?” She discover locked doors and she reaches in her pockets, “No sonic. Empty pockets. I hate empty pockets.” Ryan and Yasmin arrive. The ball of tentacles leaves after completing its mysterious mission. Yasmin tries to take charge of the scene and calls the Doctor “Madame”. The Doctor: “Why do you call me ma’am?” Yasmin: “Because you’re … a woman?” The Doctor: “Am I? Does it suit me? Oh yeah, I remember. Half an hour ago I was a white-haired Scotsman.” This confuses everyone. She has them introduce themselves, Yasmin gives her title, the Doctor wants her name, Yasmin tells her its Yasmin Khan, but her friends call her Yaz. Ryan introduces himself. Everyone is in Yaz’s squad car. Yaz says hello to Grace whom she knows. Grace explains that Ryan has dyspraxia, which affects his coordination, so she and Graham were trying to teach him to ride a bike at 19. Ryan took pictures of the blue object. When they get to the spot where Ryan saw it, the blue object is gone, but the ground it laid on is still smoking. They wonder where it could be. Someone in a white van picked it up and took it to a workshop, delivering it to Rahul (Amit Shah). The Doctor’s soon to be companions split up to gather more info. Yaz talks to her supervisor, Graham talks to his bus driver buddies, Ryan searches the internet for strange occurrences in Sheffield, and Grace checks her nursing sources, while the Doctor who is still feeling the effects of her regeneration takes a nap at Grace and Graham’s home. Meanwhile in Rahul’s garage, the blue orb breaks open; the ball of tentacles is on a roof scanning the city, and the Doctor wakes up refreshed from her nap. She asks to see everyone’s collarbone; all of them have a dot on their collarbones. The Doctor explains the ball of tentacles placed a DNA bomb on them on the train. If it goes off it will melt their DNAs. They all begin to ask her questions but she has to explain to them, “Not yet who I am. Brain and body still rebooting, reformatting. [Sees Ryan’s phone] Oh, reformatting!” She takes his phone and reformats it so they can track down the source of the bombs. An armored creature emerges from the orb. Rahul: “Where is my sister?” Creature: “Ask me again.” Rahul: “Where is my sister?” Creature: “You will never know.” It brutally kills Rahul. The Doctor follows the signal to Rahul’s garage. They arrive and see the armored creature. The Doctor: “Oi. I was expecting a tentacle-ly thing. Don’t you move.” The creature runs away from them. The Doctor chases after him. Graham: “Why is she running after another alien?” Yaz: “Don’t just stand there, come on!” Graham: “Oh now, you’re all running after it.” The creature escapes. Rahul’s office has pictures of him and his sister along with graphics and data. Yaz: “Do you believe she’s an alien?” Ryan: “Yeah, I think I do, yeah. Is that mad?” Yaz: “No, I think I do to.” His computer has a file for if he is dead. The Doctor is preparing to build a new sonic screwdriver. Graham: “You don’t look like an alien.” The Doctor: “You should have seen me a few hours back – my whole body changed. Every cell in my body burning. Reordering, regenerating.” Grace: “Sounds painful love.” The Doctor: “You have no idea. They watch a video of Rahul. Seven years ago, something abducted his sister Asha. He spent the past seven years tracking energy signals and atmospheric conditions to see when they’ll return. It finally happened that night, and he’s going to try to find out what happened to his sister and prevent this from happening to anyone else. The Doctor is touched. She tries to figure out what is happening. She comes up with a theory; two warring alien races are going to use Earth as a battleground. Yaz is upset they plan doing this in Sheffield. Graham gets a call from one of his bus driving buddies about the tentacle creature. The Doctor grabs some electrical wires and the group heads downtown. They get to the rooftop where the ball of tentacles is. They use the electrical wires to shock the creature immobile for a short period. Ryan: “Get in! It actually worked.” The Doctor: “Of course it worked. I’m not an amateur.” The Doctor examines it with her sonic and realizes it’s a bioweapon gathering info. Her theory about two waring alien races is wrong. The armored creature appears on the rooftop, “Which one of you should I kill first?” The Doctor tells her companions to get behind her and she confronts the creature. They begin asking the other one questions. The Doctor is making up her plan as they go along. Since the ball of tentacles is guarding Karl’s crane, they get on the crane across from it. She wants Ryan and Yaz to operate the crane [which neither has done before] while she gets Karl. They are to line up the crane with Karl’s crane so he can walk over to them. While they are doing this, the Doctor goes up and tells Karl to walk across the crane. Before he can do it, the ball of tentacles short circuits his crane so he’s forced to jump. When he tries to jump, Tim Shaw catches him and drags him away. The Doctor jumps to the other crane to save Karl. She doesn’t quite make it all the way over and dangles from the edge, “These legs definitely used to be longer.” She pulls herself up and confronts Tim Shaw. The Doctor: “What do you do with them, your human trophies? Tim Shaw: “They are held in stasis in our trophy chambers, on the cusp between life and death.” The Doctor: “Left to rot. How completely obscene.” Tim Shaw: “They’re not important.” Karl: “Hey, I’m important.” Tim Shaw threatens to detonate the DNA bombs on the Doctor and her friends. The Doctor: “Yes, I’m glad you asked that again. Bit of adrenaline, dash of outrage, and a hint of panic knitted my brain back together. I know exactly who I am, I’m the Doctor. Sorting out fair play throughout the universe. Now please, get off this planet while you still have a choice.” Tim Shaw: “I choose to win.” He detonates the bombs but they begin beeping on him. The Doctor explains that with her sonic she took the DNA bombs off her companions and her and put it back on the ball of tentacles. When he did his transference, he didn’t only get the intelligence the tentacles collected, but the bombs. He’s ready to explode so she tosses him the recall circuitry and Karl kicks him off the crane for good measure. For some reason the Doctor doesn’t approve of that. After Grace and Graham evacuate the worksite, Grace wants to go back in so they can electrocute the ball of tentacles to protect Ryan. Grace instructs Graham to attach the electrical wires while she electrocutes the tentacles. Grace: “Is it wrong to be enjoying this?” Graham: “Yes!” She begins electrocuting it, the ball of tentacles falls apart, but Graces falls off the crane. Graham rushes to her. Grace: “Promise me you won’t be scared.” Graham: “What do you mean?” Grace: “Without me.” Ryan, Yaz, and the Doctor get there in time to watch her die. We return to the YouTube scene from the beginning of the episode. Ryan wasn’t talking about the Doctor, but his grandmother. He tells his audience how his mother died six years ago and he went to live with Grace. Ryan: “It’s like the best people get taken first…She died like she lived, trying to help other people.” Ryan goes back up the hill to try to ride that bike. He keeps falling, but gets up each time to try. The Doctor is in the distance watching him. Graham speaks at his wife’s funeral. He knows she would tell him not to be sad because they had three great years together, but he’s sad because he wants more. Graham says that she was a better person than he was, and that she should be alive instead of him. After the funeral, Graham tells the Doctor that he has cancer; he has been in remission for the past three years. Grace was his chemo nurse, and they fell in love. Yaz asks the Doctor if she has family. She tells her she lost them a long time ago. Ryan asks how she handles it. The Doctor: “I carry them with me. What they would have thought, and said and done, make them a part of who I am, so even though they are gone from the world, they’re never gone from me.” Yaz asks how she handles the type of events they just experienced. The Doctor: “I’m just a traveler. Sometimes I see things need fixing, I do what I can.” The Doctor remembers she doesn’t have the TARDIS and she needs to be off looking for it. Yaz points out she needs to change her wardrobe. [The Doctor has worn the Twelfth Doctor’s tattered clothes the whole time.] Yaz and Ryan take her shopping and the Doctor picks out her new outfit, Yaz gets the honor to pay for it. Back at Rahul’s shop, the Doctor is going to use the Stenza technology from the transport chamber to go to the planet where the TARDIS is. She was able to follow the TARDIS signature energy. She needs her new friends help in holding the equipment while she uses her sonic to transport. The Doctor: “Okay you three, I’m almost gonna miss ya.” She activates the device, but it not only transports her into space, but Graham, Ryan, and Yaz. The Doctor falls out of the sky and crashes through the roof of a train that has a ball of tentacles attacking the passengers on the train. The Doctor meets her new friends, Graham [a retired bus driver], Grace [a nurse and Graham’s wife and Ryan’s grandmother], Ryan [a warehouse worker and YouTube vlogger], and Yaz [a probationary police officer]. The villain is a warrior from the Stenza race. He is on Earth hunting for a human trophy his leaders picked for him so he can become his race’s leader. Tim Shaw is supposed to hunt without any weapons and assistance. Tim Shaw is a cheater; the ball of tentacles is a bioweapon gathering coil that is tracking his human trophy for him. His race had taken a young man named Rahul’s sister seven years ago for their hunt, and Tim Shaw kills Rahul and several other people taking a tooth from them and putting the teeth on his face to prove his conquest. His tentacle coil had put DNA bombs on the Doctor and her friends, to get rid of any witnesses. The Doctor outsmarts him by putting the bombs back on the tentacle coil so that when he does a transference with it, the transference plants the bombs on him. The Doctor gives him a chance not to detonate the bombs when he thought they were still on the Doctor and friends, but he does the evil thing and detonates the bombs, screwing himself. Grace tries to electrocute the ball of tentacles to protect Ryan, but falls to her death. The Doctor figures out a way to find her missing TARDIS and uses the Stenza technology to get her there. Unfortunately, the Doctor not only teleports herself, but also she teleports Graham, Ryan, and Yaz with her. 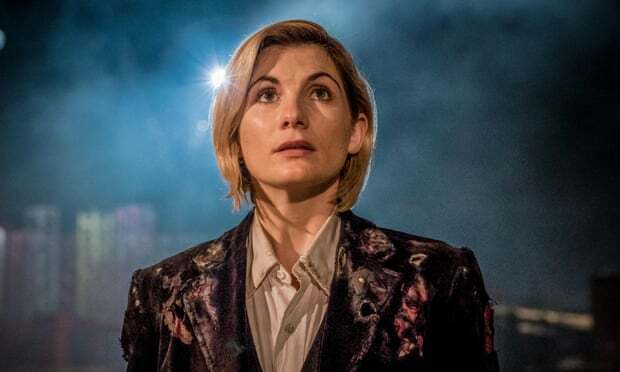 The new Doctor has arrived, and aside from being a woman, it’s the same Doctor. Still smart, still brave, still reckless, still kind, still alien, still goofy, still authoritative, and still protecting humanity from those who mean us harm. I was never worried about Jodie Whittaker because she’s a good actor, and the show has a good track record picking Doctors. She felt like the Doctor to me when she told the humans to get behind her when she confronted Tim Shaw. She was protective of her friends, showed her outrage to Tim Shaw for his cruel and obscene deeds and let him know by words and deeds that he was dealing with a superior foe. It’s Jodie Whittaker’s first episode, so like the Doctors before her, she’ll continue to grow in the role. I like her new companions, or friends. They wrote distinct personalities for the different friends and cast them well. I liked that they gave them a connection already, with Ryan being the lynchpin. It’s too bad that they killed Grace. They telegraphed her death early in the episode, plus I knew who the three companions were going to be, but now that I’ve had time to think about it, they didn’t have to kill her. It feels like they killed her to motivate Ryan and Graham to go with the Doctor and grow as people. Grace didn’t have to be in the room, so the other three could go to space without her, and Ryan and Graham’s motivation could be to get back to her. They could grow through their adventures with the Doctor. They didn’t have to kill Jackie to motivate Rose to travel with the Doctor. I’ve seen enough black characters killed on Sci Fi shows to be leery of it. The episode looked great; I read they were going for a more cinematic look for the series. I am not sure about the music yet. We only got to hear a little of the new theme, and the rest of the score sounded like any other adventure show on TV. For a first episode of a new Doctor and showrunner, it was good. I would place it below the Eleventh Hour, and tied with Rose. They took care of introducing the new Doctor and companions, and gave you a taste of what the new series will be. It had elements from the other episodes premiering new Doctors. It seemed to be more of a mixture of Rose and the Eleventh Hour. Here’s a clip of next week’s episode. Can’t wait to see it. I think I found the full theme on a video showing this season’s guest stars. If this is it, it sounds pretty good. It reminds me of Classic Who themes. Doctor Who: What the Fjord is this?